First purchase with ancient nutrition; Bone Broth Protein by Ancient Nutrition is a new staple in our kitchen. 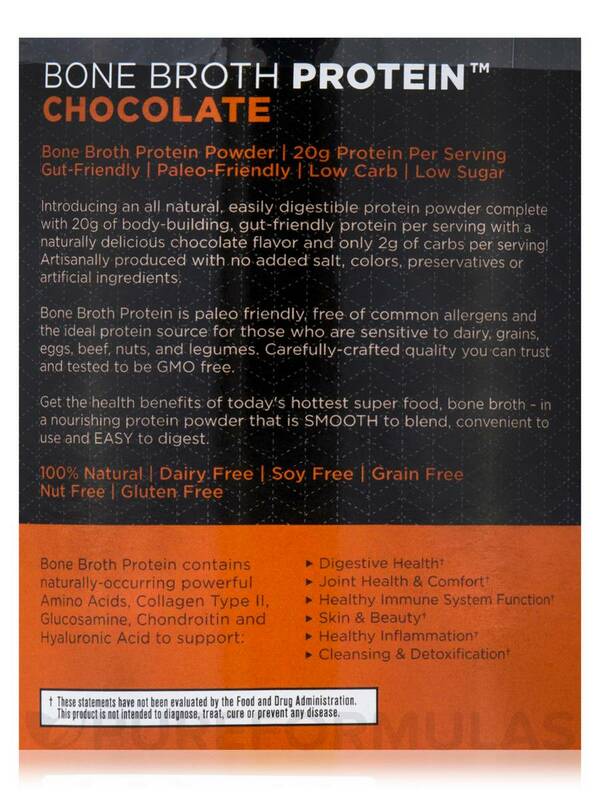 Bone Broth Protein Chocolate by Ancient Nutrition is delicious and love all the benefits from this.It has a great price as well! Supports Healthy Joints‚ Skin‚ Muscles and Detox! Introducing an all natural‚ easily digestible protein powder complete with 20g of body building‚ gut-friendly protein per serving with a naturally delicious chocolate flavor and only 2g of carbs per serving! Artisanally produced with no added salt‚ colors‚ preservatives or artificial ingredients. Bone Broth Protein is paleo friendly‚ free of common allergens and the ideal protein source for those who are sensitive to dairy‚ grains‚ eggs‚ beef‚ nuts‚ and legumes. Carefully crafted quality you can trust and tested to be GMO free. 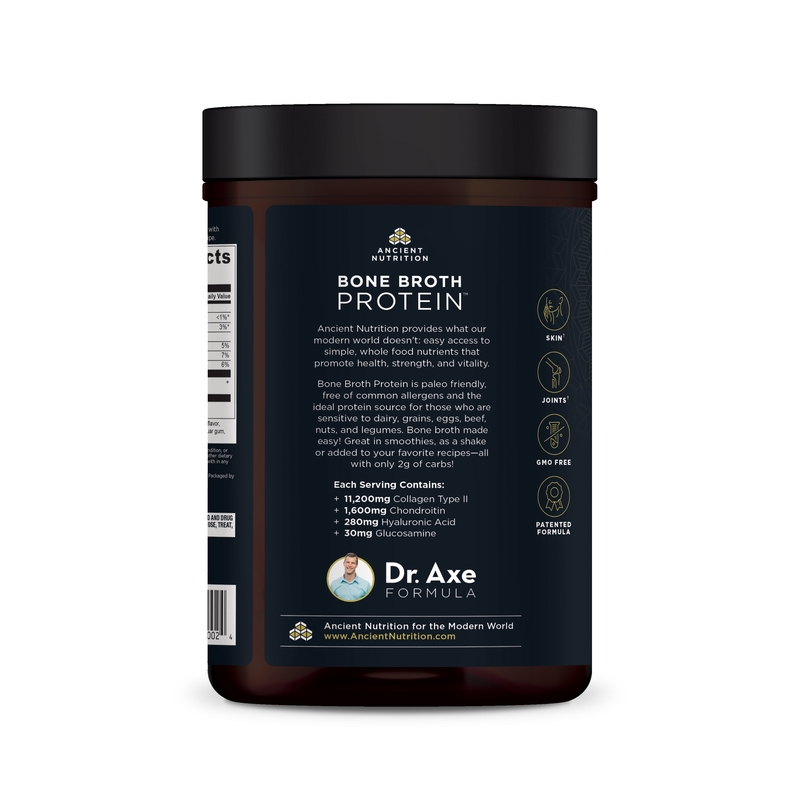 Get the health benefits of today's hottest super food‚ bone broth - in a nourishing protein powder that is smooth to blend‚ convenient to use and easy to digest. Mix one level scoop (included) in 12 ounces of water‚ juice or in a smoothie or protein shake one or more times per day. Great with almond‚ cashew or coconut milk or added to your favorite recipe. Can be enjoyed warm or cold. Advanced Use Recommendation: Consume 2-3 serving per day as a part of a fitness and diet plan or cleansing and detoxification program. Great to add to your favorite recipe and meals. As with any dietary supplement‚ consult your healthcare practitioner before using this product‚ especially if you are pregnant‚ nursing‚ or are otherwise under medical supervision. Notice: Packaged by weight not volume. Some settling may occur. Tastes good as a warm drink. Nothing really, the big canister is half full... waste of packaging. This Bone Broth Protein Chocolate by Ancient Nutrition is the best tasting supplement I've tried. It doesn't have an aftertaste. And I don't have to add a banana, like I do with other supplements, to add to the taste. I've just started taking it a couple of weeks now. I feel less bloated. I haven't noticed any other changes yet. I'm hoping it will. The container is half full. Not sure if I'll continue spending $40 every 3 weeks, unless I notice a considerable difference. My sister recommended Bone Broth Protein Chocolate by Ancient Nutrition to me. I have ordered it a few times and use it in my smoothies. I am happy with the results and the flavor. I will continue to order it in the future. Bone Broth Protein Chocolate by Ancient Nutrition contains a nice high quality protein and is supposed to do nice things for the gut too. I thought the flavor was fine, slightly off from cocoa powder with a slightly sweetened flavor, but not bad for a healthy product. I am going to try the vanilla next time for variety, but I would sure not mind buying the chocolate again. While I usually don't smell powdered food products, I did this time due to one of the other reviews, but I didn't think the smell was out of the ordinary. It smelled fine to me. Focusing on a healthier immune system realistically means using top quality products at a reasonable price. I've found my go-to protein source in Bone Broth Protein by Ancient Nutrition. It tastes great and gives me the nutritional support I want. 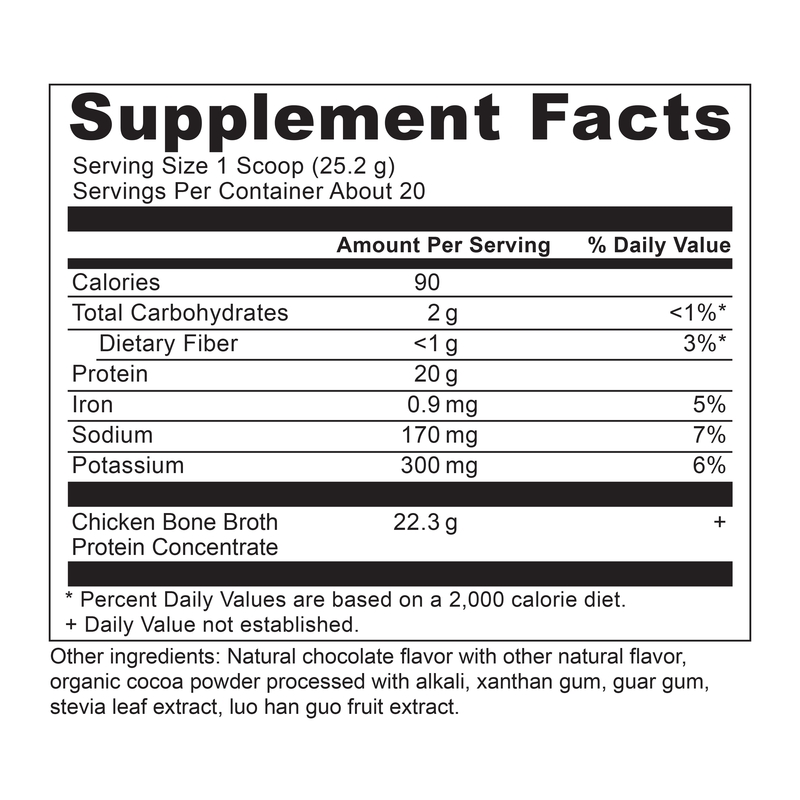 I added this same review to the Vanilla Bone Broth Protein, since I have tried both. 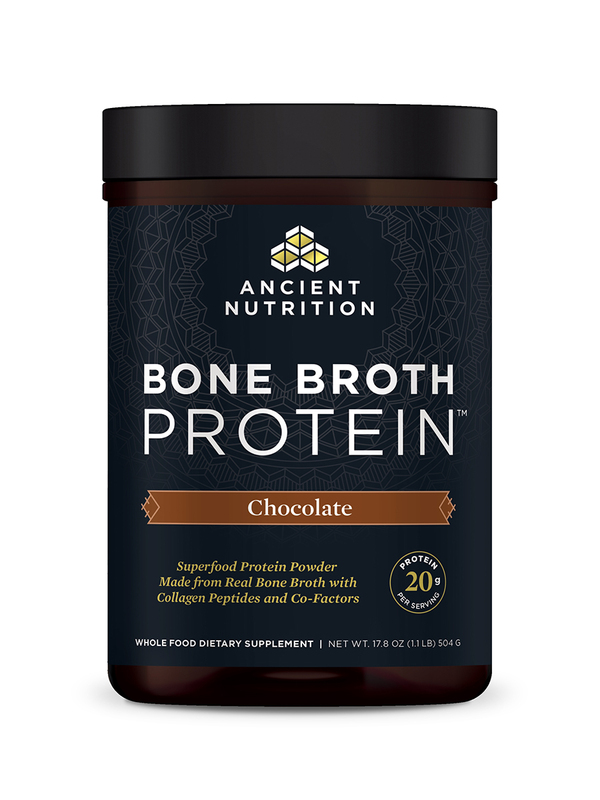 The Chocolate Bone Broth Protein by Ancient Nutrition smelled awful, and tasted worse. I had to "doctor" it with bananas and organic peanut butter just to tolerate the flavor, but it upset my stomach and I ended up tasting it all day! I do, however, recommend the Vanilla Bone Broth Powder.I've been dealing with pain (head to toe) for the last 21 years, after being hit by a drunk driver. With herniated discs, fibromyalgia, arthritis, tendonitis, a neuroma, bone spurs, spinal stenosis, and bursitis, life is pretty darn uncomfortable! Since using Bone Broth Protein, I have noticed a marked decrease in the arthritis pain in my hands (40% decrease), as well as my back, neck, foot, shoulder, and hip pain. 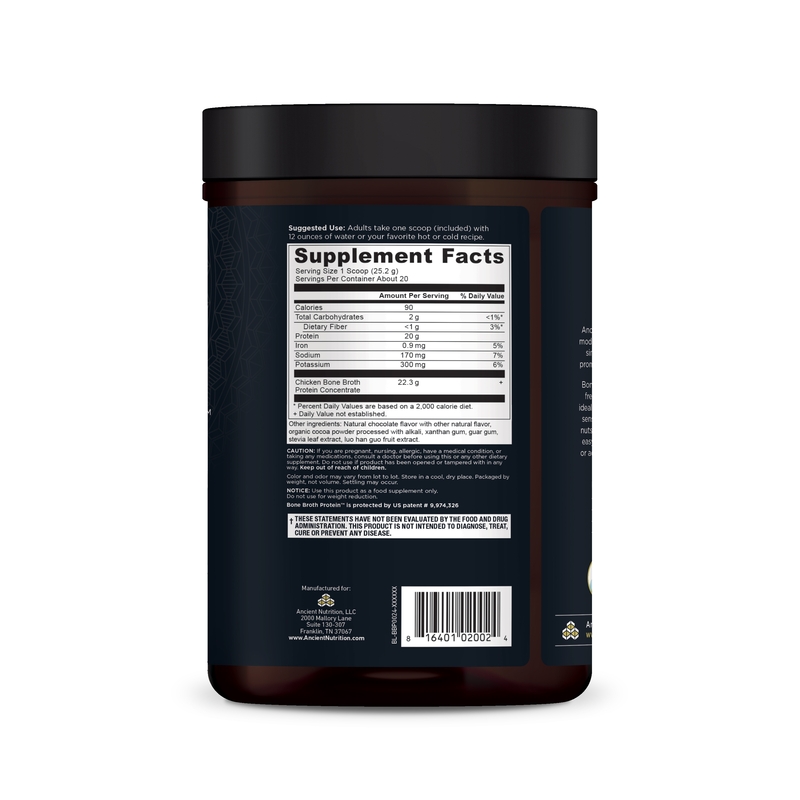 I could feel a difference in a matter of days, and believe me when I say, I'm not a believer in supplements. I've tried so many things that haven't worked, and spent thousands of dollars over the last 21 years just trying to manage the pain. I won't say it's a perfect fix, but for me, even a 20% pain improvement is significant, and this has gone above and beyond that! I went off of this for only 2 days, and the pain started coming back. I gave some to my mom to try too, and she had the same results. We bought 3 more containers the next day. I'd definitely recommend giving this stuff a try. The only downfall is that it does bother my stomach. I do have Gastroparesis, so pretty much everything I eat/drink makes me sick, but this may not be an issue for you. I bought both the chocolate and vanilla. The chocolate is foul, really foul, with a bad after-taste and horrible smell, but the vanilla, with the recipe below, is quite good. 1 cup coconut or almond milk (I use Vanilla Rice Dream) 1 cup fresh or frozen blueberries 1/2 frozen banana (I cut these and freeze them ahead of time) 1/2 tsp cinnamon (optional, but tasty!) 1 scoop vanilla bone broth protein 1/4 tsp pure vanilla extract 2 ice cubes (Blend in blender...doesn't mix well in shaker cup) Hope this works for you and really am hoping they will make the price more affordable! The container arrives half empty, so you don't get much product for the amount you spend. I'll keep using it for now, but if the price doesn't decrease, this won't be something I can afford long term. PureFormulas did have the best price I could find online though, so I really appreciate that, and will continue to be a repeat customer if their prices remain low. Flavor Smell Caused Burping / Bloating. Hi Ingrid, thank you for choosing Pureformulas. Yes this product is gluten free. Have a happy and healthy day!